One of three Servants available to the protagonist of Fate/Extra. While she was notorious as a tyrannical emperor and for her arrogance as an artist with supremacy comparable to the gods, She is a kindhearted individual who wanted what was best for her subjects. 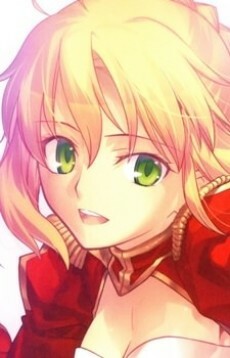 Saber's identity is Nero Claudius Caesar Augustus Germanicus, the Fifth Roman Emperor. She had the reputation of a notorious tyrant whose rule was made up of schemes and poison as she oppressed all religious forces, especially Christians, and the Roman Senate during the period from 50 to 60 AD. It is believed in one theory that the Book of Revelation was written as a reaction against said oppression. She was regarded in the same light as the devil, as the assumed Hebrew pronunciation of of her name as a emperor, Caesar pronounced as "NRVN QSR", equates with the "Number of the Beast". This name and the "Beast of Babylon" refers to Rome itself and it is not an alias given to her as an individual.